On the first episode of The Prompt podcast, I chose Pushpin 2.0 as my weekly pick, and I thought the app deserved a mention here on the site as well. In January, when I first reviewed Pushpin, I noted how the app didn’t look as good as Pinbook, another Pinboard client that, back then, didn’t support some of the power-user functionalities that were available in Pushpin. Many Pinboard clients have come out in the past few months; as MacStories readers know, my choices have always been Pinbook, Pushpin, and Pinbrowser – while these three apps were all made for Pinboard, each one of them had a peculiar feature that made it stand out. With Pushpin 2.0, I feel like the difference is now marginal, as the app takes important steps towards becoming the only Pinboard client you’d ever need to add, manage, and browse Pinboard bookmarks. The most notable addition in version 2.0 is the new design. Pushpin 1.0 didn’t look good; Pushpin 2.0 is a pleasure to look at, with a gorgeous silver theme and various shades of gray and blue that highlight information and details. Where Pushpin 1.0 employed a very “default” approach to navigation with a series of tabs at the bottom to move between sections and settings, in Pushpin 2.0 everything has been redesigned and condensed in a Browse screen, where you’ll still get access to your Personal bookmarks, Community ones, Settings, Notes, and Tags. Sharing and tap & hold menus have been give a dark facelift; iconography has been revisited to give the app a modern, friendly look. Pushpin 2.0 is, in terms of custom iOS design, one of the best apps I’ve seen recently. With this update, Pushpin gets support for Saved Feeds, which allow you to view streams of bookmarks filtered by tags, usernames, or a combination of both. One of the greatest aspects of Pinboard is, in fact, the community of users who may decide to keep bookmarks public or private. If they choose public, you’ll be able to browse those bookmarks and therefore use Pinboard as a “discovery tool for interesting links” (I do this every day). Saved Feeds enable you to be more specific with the kinds of links you want to discover, and I believe Pushpin’s implementation is solid. 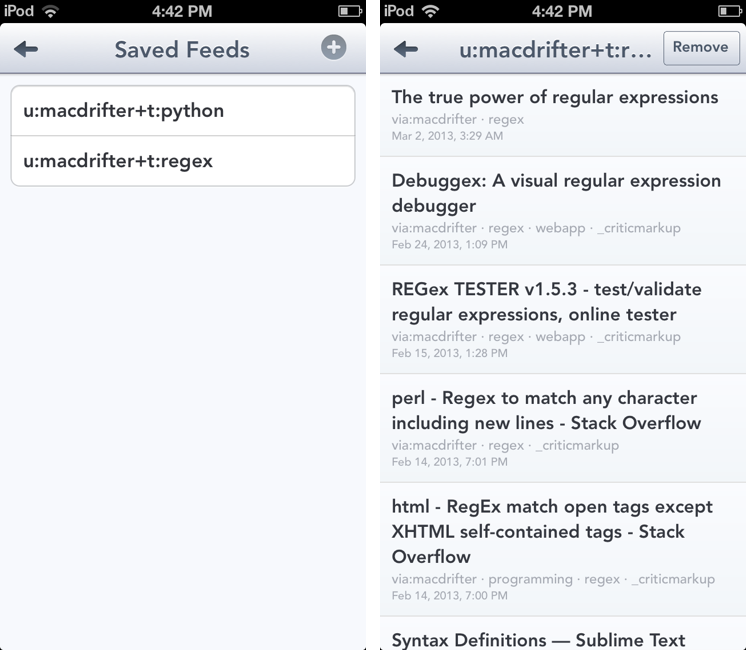 The process of viewing webpages and adding them as bookmarks has been substantially improved. In the app’s web view, there’s a new option to view a page through a mobilizer (Instapaper is my favorite; Google and Readability are also available) and a button to enter full-screen mode, with a draggable “puck” that can be rearranged on screen and tapped to go back to normal mode. In the Add Bookmark screen, you can now swipe right on the tag field to let Pushpin load popular and recommended tags, which I consider a nice touch to suggest users which tags they should use. Tags can be hidden by swiping left on them, or you can prefix them with a period to make them private. There are some new features of Pushpin 2.0 that I’m not particularly sure about. For instance, there’s a new setting to hide bookmark tags and descriptions in a list view by default, or you can use a pinch gesture to hide/show them; the gesture is nice, but I’m not a fan of having to operate a device with two hands – I’d rather see a view button next to the search bar (like Tweetbot), so I can keep using my iPhone with one hand. The app’s new tab-less interface is good-looking, but it has forced the developer to remove the “Add” section, which allowed you to manually enter a bookmark independently from the web browser. It’s still possible to add bookmarks through the URL scheme and automatic clipboard detection, but I believe the manual option was important. And, as you may have guessed from the screenshots in this article, Pushpin still isn’t optimized for the iPad. At $9.99, Pushpin 2.0 is a powerful Pinboard client for users who want to use Pinboard to add bookmarks, manage them, and discover new ones using the service’s (lightweight) social features. Pushpin 2.0 looks great on the Retina display, and new features like Saved Feeds, new tag filtering and suggestions, and improved web browsing strike a good balance between advanced functionality and general usability. Pushpin 2.0 can be used as your only Pinboard client on the iPhone, packing both management and browsing features, and I’m looking forward to an iPad version. Pushpin 2.0 is available on the App Store.